Carlingford Lough (Loch Cairlinn in Irish) (Cairlinn being shortened form of "Cathair Linn" literally translated as "City of the Pool") is a sea loch that forms part of the international border between Northern Ireland to the north and the Republic of Ireland to the south. At its extreme interior angle (the northwest corner) it is fed by the Newry River and the Newry Canal, which link it to the nearby city of Newry (the Canal continues on towards the River Bann and Lough Neagh; the river, under the name River Clanrye, loops around County Down). On the northern side, in County Down, are the coastal towns of Warrenpoint and Rostrevor, backed by the Mountains of Mourne, and on the southern side are Omeath, Carlingford and Greenore, all on the Cooley Peninsula in County Louth. On 3 November 1916 two steamers, the SS Connemara and the SS Retriever, collided and sank in the loch with the loss of 94 lives. 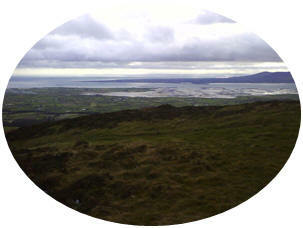 It is believed a ghost ship can be seen on Carlingford Lough on the night before a disaster. It was apparently seen the night before the the crash between the Connemara and the Retriever.